New grant will support organic seedling production, training, and demonstrations at the UC Santa Cruz Farm. 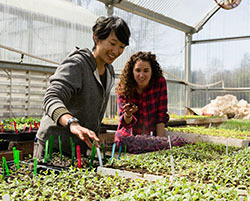 Assistant garden manager Kellee Matsushita instructs advanced apprentice Sarah Cousins in the UC Santa Cruz Farm greenhouse. 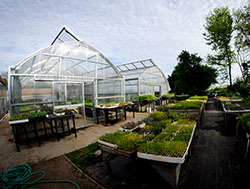 Organically managed greenhouse facilities at the UCSC Farm. The Center for Agroecology and Sustainable Food Systems has received a grant from the California Department of Food and Agriculture (CDFA) to support demonstrations and training in organic seedling production at the UC Santa Cruz Farm. The 3-year, $265,000 grant from CDFA’s 2017 Specialty Crop program will fund infrastructure improvements, classes, field days, and a “how-to” publication for growers interested in producing their own organic seedlings. CASFS staff members will also test a variety of soil mixes, supplemental fertility options, and greenhouse conditions to measure their effect on seedling quality. “Sourcing quality organic starts is a challenge for smaller-scale growers,” says Christof Bernau, who helps direct the greenhouse operations at the UCSC Farm. According to Bernau, few transplant production nurseries serve smaller operations, either because the nurseries' production minimums are too high, or the costs to purchase and ship seedlings are prohibitive for many small farmers. Growers producing their own seedlings can save money while responding nimbly to changing market demands by producing a diversity of crops and varieties. But producing quality seedlings can be challenging, with losses running as high as 30% in some organic nursery operations to factors such as pests and diseases. “In organic seedling production, knowledge of how to maintain ideal environmental conditions for young seedlings is the best defense against pest and pathogen issues,” says Kellee Matsushita, CASFS assistant garden manager. The CDFA grant will fund a suite of efforts to document and teach best practices in organic nursery production for small-scale organic growers, with a focus on creating optimum conditions for healthy growth, and developing and sourcing soil mixes that are economical, and provide proper aeration, drainage, water holding capacity, and sufficient fertility using sustainable sources. Both economics and the environment are in play: conventional greenhouse growers rely heavily on synthetic pesticides and fertilizers to produce seedlings. “We want to equip growers with key production skills for economic success that are also environmentally responsible,” says Bernau. In addition to on-site trainings and field days, the project will share results and best practices via a webinar and a free online and printed Organic and Sustainable Seedling Grower Guide. Field days are planned for 2018 and 2019, and will be listed on the CASFS website when scheduled.